Topics: Spay-neuter Clinic, Adopt A Pet, Judy's Pet Lodge, and Tax Exempt Donations. 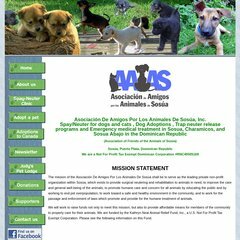 aaasosua.com Asociación De Amigos Por Los Animales De Sosúa, Inc. It is hosted by Loose Foot Computing Limited (Saskatchewan, Regina,) using Microsoft-IIS/6 web server. The programming language environment is ASP.NET. Its 2 nameservers are ns2.loosefoot.com, and ns1.loosefoot.com. PING www. (208.68.104.134) 56(84) bytes of data.